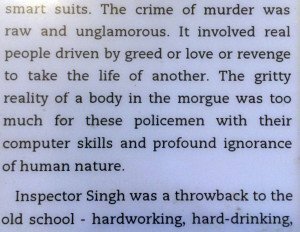 No sooner had I finished the first Inspector Singh novel, than I started on the second – and books 3-6 are already stacked up and waiting on my Kindle – so addicted have I become to these murder mysteries set in SE Asia, and starring the wonderful overweight, chain-smoking, wheezy, unconventional Inspector Singh of the Singapore Police. The second chapter of Inspector Singh’s adventures opens in Bali, an island devastated by the Bali bombings, nearly empty of tourists, and where the maverick Inspector has been sent to help the Indonesian authorities, despite the fact that he knows nothing about counter-terrorism. He has pointed this fact out to his bosses, but they seem delighted to be rid of him for a while. For his (presumed) sins, Singh has a partner, the larger than life, overweight, informal Bronwyn Taylor, of the Australian Federal Police. 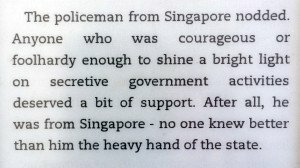 Both of them have been despatched by their relative countries to help with security and counter-terrorism measures after the bombings, and since Singh knows his bosses back in Singapore are looking for any excuse to turf out such an unconventional, un-Singaporean, copper he has to get on with Bronwyn. Which he doesn’t find easy. 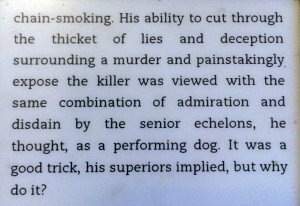 And then the tables turn a little when they discover that amongst the heart-rending remains of badly burned and shattered bodies there is one fragment – for that is all that remains – with a bullet hole through the skull. And these 2 unlikely partners launch a murder investigation in the middle of a massive terrorism situation. Only now Sigh has the upper professional hand, since he knows a whole lot about murder (and nothing about counter-terrorism) whereas the affable Bronwyn is a complete rookie in murder investigations – but takes to it with great enthusiasm and a cheerful willingness to do Singh’s often ill-tempered bidding. 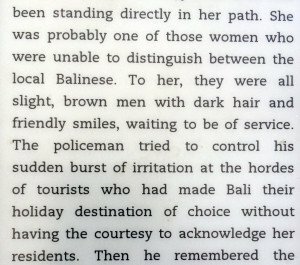 Ms Flint writes with great skill, weaving her exciting whodunnit against the background of a country traumatised by the violent bombings, by the religious divide, by the sudden exit of the tourists who are the backbone of the Balinese economy. Ms Flint has her finger totally on the Asian pulse. 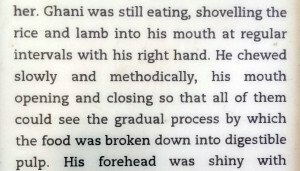 This extract below, describing the driving style of their wrap-around-sunglassed driver who wants to sell them anything and everything, talks non-stop, and turns out to be a fabulous bloke. 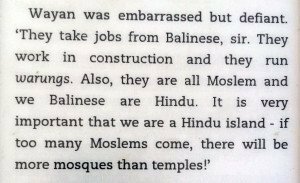 I live in India, and shortly before reading the extract (above) I had been driving for 10 hours through rural north India. 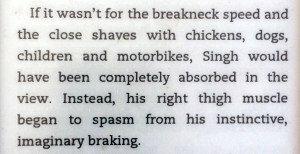 Yup, I had an aching leg from instinctive, imaginary braking, too. The murder investigation is absorbing, and the depiction of the poor, gentle Balinese trying to move on from such a tragedy is tenderly written. I won’t spoil the plot by telling you anything more (of course I wouldn’t do that to you) – but suffice it to say that I had tears in my eyes in the closing pages. A great read, with a great central character, the irrepressible Inspector Singh.